I'm undergoing another gout attack so I'm zonked on pain killers right now . . . so maybe I'm overlooking something obvious but I seem to be unable to access my Kingdom of Stagonia blog. It was created using a different email account and Google (which absorbed Blogger) won't let me use that email address. The sharp-eyed among you will notice that there are two fewer foot units than in the forces of the Principality of Saxe-Bearstein. This is because those two are still in the process of being painted. Their facing colors will be black and orange by the way. In addition the army has two units of irregular foot and three of skirmishers . . . all of which are fully painted and based. To the left is a glimpse of the Stagonian Horse and Dragoon regiments. As with their opponents they will have a pair of Hussars as well (one of which is painted and one which is not). And, of course, there are officers and artillery . . . all ready for the table top. 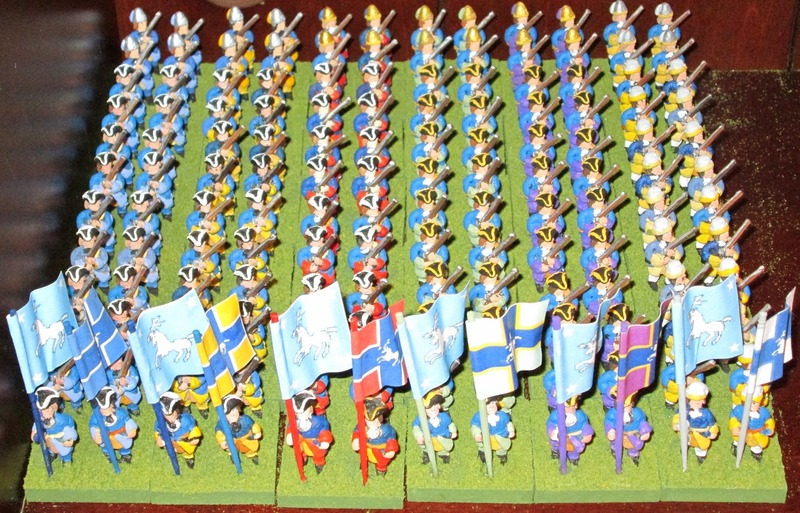 Again all of the figures in the Stagonian army are Blood Axe Miniatures . . . sculpted by Lance Runolfsson and available from Historifigs. But the Stagonian figures are drawn from the Great Northern war line of figures as opposed to the Saxe-Bearstein figures which are mostly from the War of Spanish Succession line. The primary difference being that the Stagonian figures have turnbacks whereas the "good guys" do not. You might well notice that the grenadier hats are also quite different. 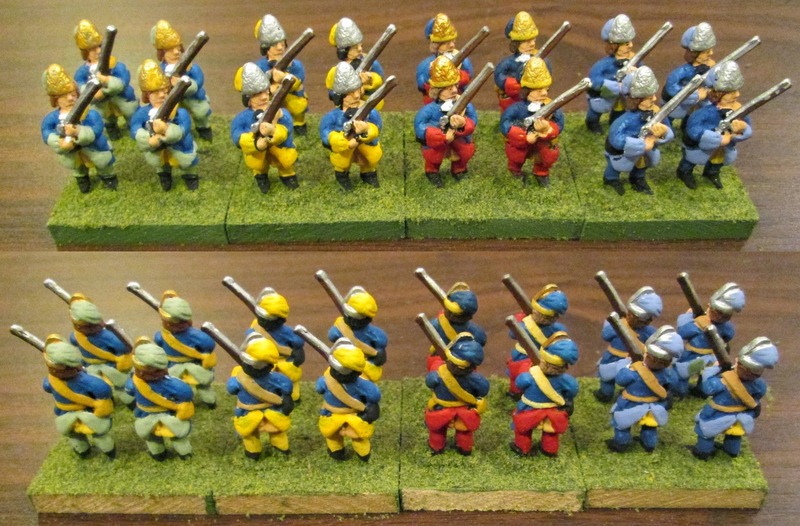 You can compare them with the WSS (non-bearskin) versions from my last post. Actually I should clarify that the irregular units for both armies are mostly drawn from the Blood Axe GNW forces of Russia and Poland. Again the irregular companies (i.e., stands) are based in a loose diamond shape instead of the more traditional two by two companies of the regular line troops. Above you can see some in both line and column formations . 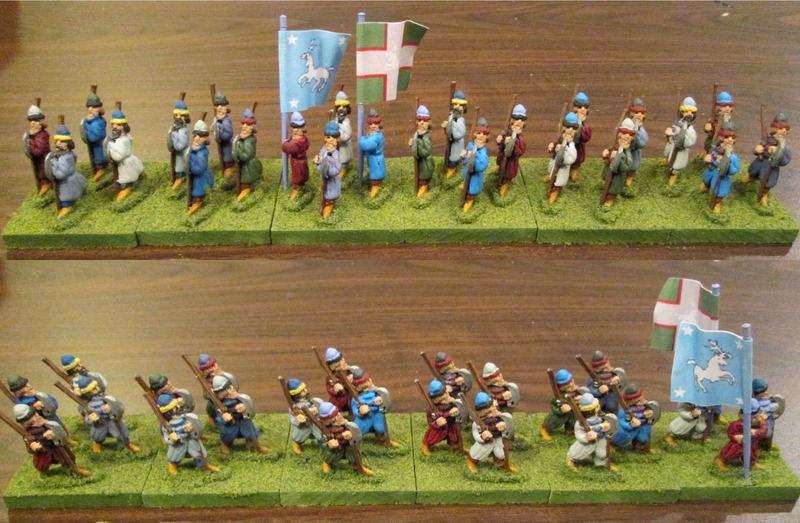 . . and again they are based on the same size bases as the mounted troops (around 50mm square) instead of the 40mm square basing of the regulars. Great looking troops.I notice your slighty thicker basing - can you tell me a little about them? Yes, I like thick bases. They are easy to pick up by the base instead of the figure. They also are easily moved as a "block" . . . and there is no problem of the bases sliding over each other and cutting figures off at the ankles (which I've had happen with thin steel bases). So what I use is ordinary (and very inexpensive) 1/4" MDF (medium density fibreboard). A friend has a table saw and is kind enough to cut it to my specifications. Also you may have noticed that I've not yet painted the rear side . . . that is because I can either color code them OR use printed labels to identify units.